The Bic Round Stic is an iconic pen. Not so much as the Bic Cristal, but still quite well known. It is a fairly robust pen, but usually one of few colors. 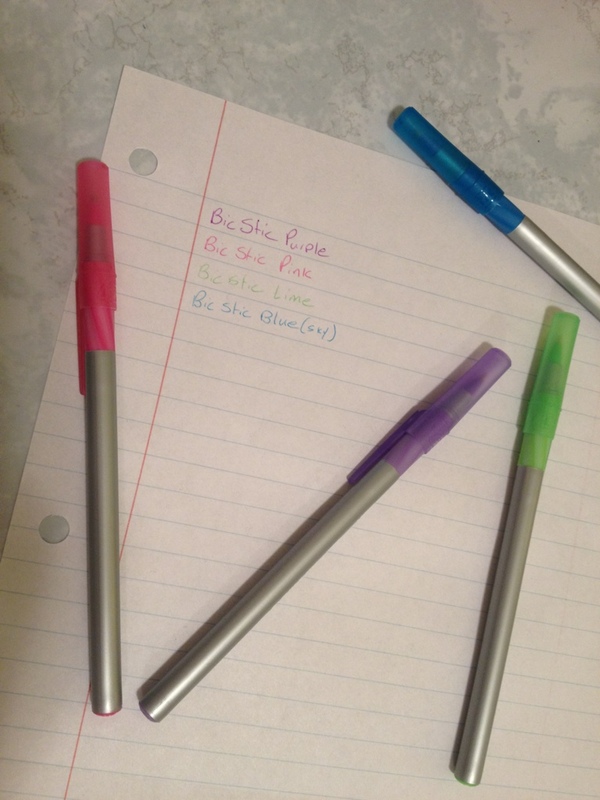 The pen usually comes in the four standard colors: black and RGB. With some hunting, though, one can find more exotic colors, like the ones I will be talking about today: the pink, lime, purple, and sky blue colors. First up is the pink, which is a nice color. It certainly isn’t hot pink, which I despise. It covers well and writes smoothly. It’s fairly dark but still quite pink, though not a very natural pink. It’s the kind that could really only be seen from an ink like this and not anywhere else. Next is the light (sky) blue, which writes smoothly, but has many little imperfections in the line. It just doesn’t cover well. The color is fantastic, though. It can be a bit hard to see at times but it’s quite pleasant to look at and not particularly eye straining. It is most like the colors at the edges of a clear body of water or the sky closer to the sun, so rare, but not unheard of in nature. On to the lime, which is by far the hardest to read of the group. And it has some startup and writing problems, though when you get it working it does write smoothly. On the paper, the green is so light as to be unreadable in many cases and can cause eye strain. Though I call it lime, it really is much lighter and closer to… well, nothing that I can think of. And finally, the purple, which is the best in terms of pen quality. It has no startup issues, writes smoothly, and covers well. It is darker than the blue but not by much, and still would require a second glance to read from far away. That being said, it is a very pleasant color to look at and is great for use when a more standard office color is not necessary. The color would be a rare one to find in the wild, though. 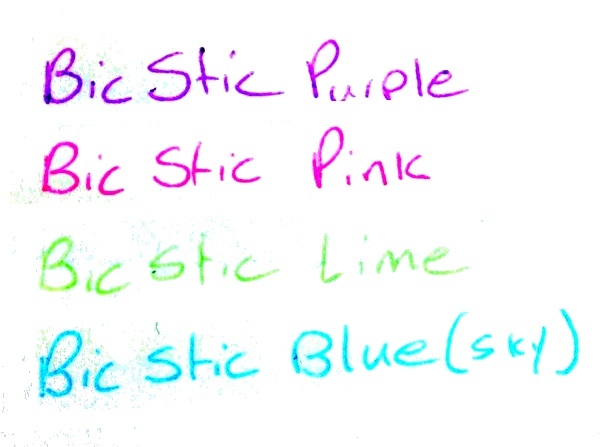 This entry was posted in Beginner Supplies, Utensils and tagged bic, bic pen, bic pen colors, bic round stic, blue, colors, green, light blue, light green, Lime, pen, pink, purple, review by Dragon Co (Austin Smith). Bookmark the permalink.